VPN the short form of Virtual Private Network. When an user get blocked from a website, at this case it is necessary to have VPN protocols to browse this website. In this post, I will discuss on “vpn types comparison”. Websites block users for making invalid activity. But some of the websites blocks users for making a such type of activity that is not major. For that, the user lost the accessing power of the website whether it is very necessary to browse. To solve this misunderstanding problem, the user need to use VPN. Actually, VPN makes hidden the real IP address and show an another IP address to the website. Let's have a speedy look on the names of 5 types vpn. 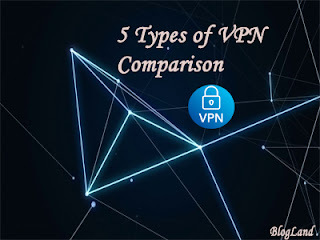 Although you may find a lot of vpn types but we are going to compare among 5 types in this post. Have a first look on 5. So, here are the 5 types of vpn protocols we will make comparison among. Here I will tell what is the vpn actually one by one, why we need to use, how to use and when to use. SSL is a browser based or used in browser type vpn. It secures the websites from being hacked. Basically, it estublishes a secure connection between client and the host. Websites are mainly contains payment method, SSL is very necessary to them to ensures payment secure. This VPN mainly used to connect more than one sites. It is quite similar to Point-to-Point Tunneling Protocol(PPTP). But it is not dedicated like PPTP for building connection between client and host. This is the most pricy vpn among all because this is the combination of all vpn. It's a complete package where all other vpn exists and gives the most working possibility and most flexibility to the users. It is best in quality among all other vpn protocols exept Hybrid VPN to build site-to-site connectivity. Actually, this vpn works with multiple protocols. This is mostly used by internet service providers. The most using vpn is PPTP and obviously the most common to users. It doesn't need extra hardware or software except a simple add-on. Connection can be estublished by this add-on. It is not so pricy like others. If you are personal user, you can choose this vpn without any doubt. So guys, this is the comparison among 5 types of vpn. I hope you got the basic idea of all. Now you are able to choose the best choice for you according to your need. Please leave a reply on the comment box. If you like this post, and then please share it on Facebook and Twitter. Thank you so much for being here. Thanks for sharing About the VPN. I did not know about them as much. Keep up the Good work. Thank you so much for your nice complement. Keep yourself with BlogLand. Best wishes for you.